2013. 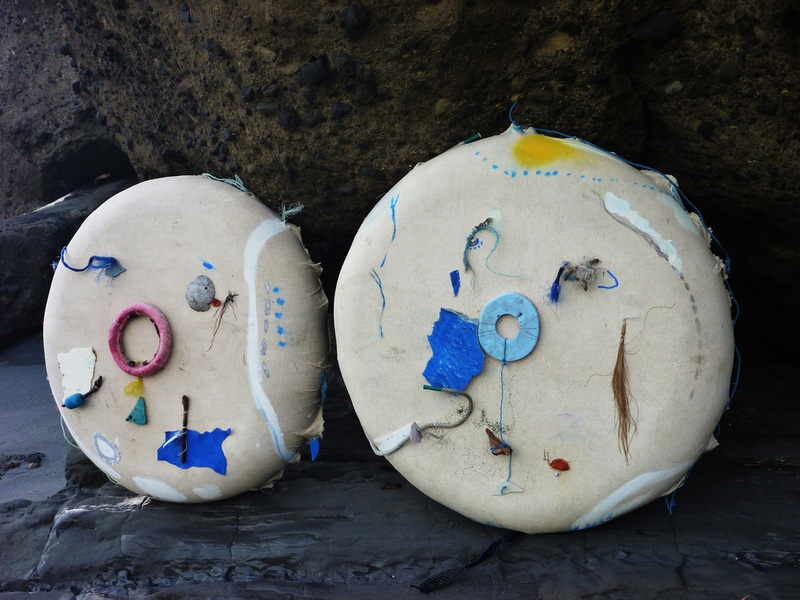 Enamel paint, truck inner tube, found flotsam from Pacific Ocean, air and water from Pacific Ocean and earth on unprimed canvas. Approximately 98cm x 98cm. Exploring the notions of taking a journey into the unknown, of leaving some place and time and going into and towards a new place and time, these floating independent forms continue to challenge and question the action of image making and the relationship and slippage point between object and subject. The idea of this floating painting vessel, inflated with the energies of wind and light when pumped up on the beach, is taken further by exploring Native American kachina practices through the collection and compositional narratives of using ocean flotsam. The central theme of the kachina practice is the presence of life in all objects that fill the universe. Everything has an essence or a life force, and humans must interact with these or fail to survive. Through time drifting upon the ocean with free association, Reaching Out There is an empty and weightless object that becomes a painting imbued by the objects that are collected and fused within its form, and through the journeys of exploring and being present in a heightened sense of real time within this universe. Reaching Out There seeks to reveal and expose and flow with the mystical truths that make up the universe.